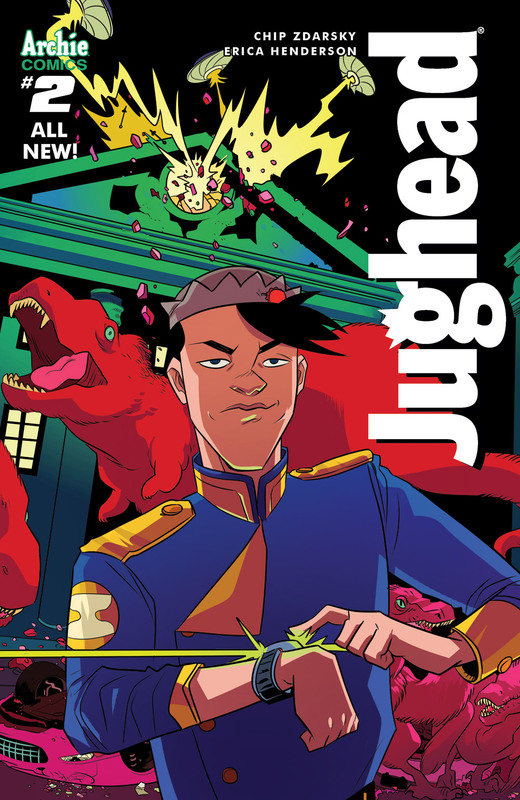 Jughead #2 Review – AiPT! Last month’s issue of Jughead was awesome! It’s clear that under a competent and creative team of artists, this classic character has been revitalized for a modern age. Let’s crack open another issue of Jughead, relax with the comic in one hand and a hamburger in the other — while we ponder the question, is it good? This issue contains two stories, one existing within a dream sequence. The first story shows Jughead reacting to the new gym teacher — a brutal, yet somewhat accurate representation of a middle school gym teacher. The coach’s new cutthroat policies threaten to tarnish Jughead’s perfect record of no detention. In the middle of this conflict Jughead has a dream in which he imagines a descendant of Archie traveling back in time to enlist Jughead in an effort to stop an evil tyrant of Riverdale in a Back to the Future-esque adventure. All of the stories are great fun, but they have the added benefit of being tightly tied around a strong thematic core. This issue demonstrates Jughead’s tendency to find loopholes and bend the rules to his favor. Is Jughead a good kid? Not really. He’s lazy, and selfish and gluttonous. Yet he somehow manages to maintain good grades and a tidy disciplinary record, infuriating all of his much harder working peers. Even though it’s all crazily exaggerated, I can compare Jughead’s nature to fellow high schooler peers of mine; I share in the frustration his classmates feel when they see him doing so little but achieving so much. What makes this issue satisfying is that the wacky stories are anchored by events that resemble real life. Although for the most part the story was pretty compelling, the Back to the Future sequence was far less compelling. I appreciate the attempt to pay homage to Back to the Future, but at times it felt forced and dull. The initial appeal of the parody combined with the thrill of seeing the “descendants” of regular Archie characters wore off towards the end of the scene. There were just too many crazy elements and the end effect was a feeling of excessive gimmick. Again, Erica Henderson brings her delightful art style to this issue. Her paneling is visually interesting, and her colors are simply lovely. There is a wonderful feeling of movement in this issue, especially during the portions of the comic in which the characters are participating in sports. The only gripe I had with the art in this issue was that sometimes the facial expressions are kind of wacky; a nose that’s a little too big or an exaggerated set of eyes. Nothing huge, just minor complaints. Yes, this is another very solid issue of Jughead, even if it didn’t live up to the quality of it’s debut. I recommend this comic for children and adults alike, it’s in equal parts thoughtful and playful. Check out a full preview here.